Nuremberg—1.FC Nürnberg vs Fortuna Düsseldorf saw two clubs trying to recover from midweek defeats. The big questions ahead of the game were: How would der Glubb react t0 the 7-0 defeat to Dortmund? How would Fortuna Düsseldorf react to the 2-1 Rheinderby defeat to Bayer Leverkusen? How would Nürnberg react to the 7-0 midweek defeat to Borussia Dortmund? Cautiously! For the first ten minutes, Nürnberg approached the game with all eleven men behind the ball attempting to get Düsseldorf to overcommit. The Fortuna, in the meantime, were also cautious and as a result 20 minutes past without either side exploring the attacking third. Then in the 20′ minute, Nürnberg produced their first chance. After a corner from Fortuna Düsseldorf keeper Michael Rensing failed to clear the ball, Georg Margreiter brought the ball back to the centre where the ball eventually found defender Lukas Mühl, whose shot from 12-yards was deflected and missed the goal by a whisker. On the other side, Fortuna Düsseldorf had their chance four minutes later. Dodi Lukebakio slalomed along the edge of the penalty box, but his shot was kept out by keeper Fabian Bredlow. Lukebakio would remain at the centre of attention, Bredlow quickly played the ball forward, and Nürnberg’s counter-attack ended with Lukebakio fouling Leibold inside the box. Hanno Behrens stepped up and converted the penalty. Lukebakio was also involved in the next scene. 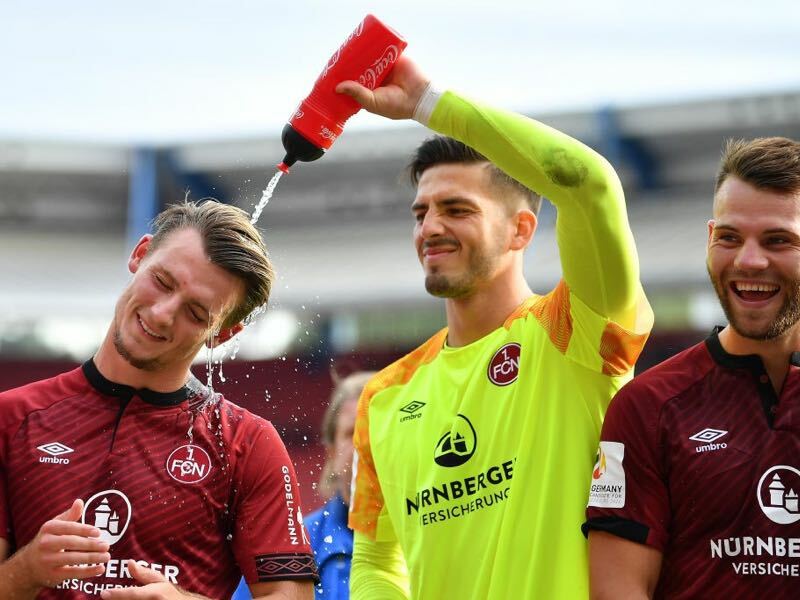 In the 33′ minute, the forward won the ball after a Nürnberg freekick broke free into Nürnberg’s half and then went one-on-one with Fabian Bredlow, who spread out like a Kraken to produce a fantastic save to deny Lukebakio. It was the last major scene ahead of the halftime tea. Right off the restart, Düsseldorf had their first chance of the second half. Ducksch won the ball at the halfway line and unleashed a shot from 20-yards out, Bredlow remained glued to the line, but the shot missed the target. Mikael Ishak for Nürnberg (54′) and Marvin Ducksch for Fortuna (57′) then had goals called back. In the 60′ minute Ducksch had his next chance, but a header after freekick cross missed the target. In the 64′ minute Nürnberg got their second. Eduard Löwen extended a clearance with his head sending Ishak one-on-one with Rensing and the striker made no mistake beating the keeper with a low drive. Düsseldorf were only briefly under shock, and the responded with attacking wave after attacking wave. Two chances after freekicks were missed in the 70′ and 73′ minute, and in the 74′ minute, Nürnberg keeper Bredlow had another fantastic moment stopping a 25-yard shot unleashed by Niko Gießelmann. It is an old football wisdom that if you do not capitalise from your chances, you will be punished. In the 78′ minute, Frederico Palacios scored Nürnberg’s third with a loop from close-range after a fantastic pass from Eduard Löwen. In the 82′ minute, Nürnberg should have added another, but Virgil Misidjan was kept out by Rensing. Nürnberg goalkeeper Fabian Bredlow was the man of the match. The keeper made four crucial saves to keep Nürnberg ahead. Stopping Lukebakio in the one-on-one situation right after Nürnberg scored the first goal paved the way for three points. From 7-0 to 3-0. Nürnberg found the right answer to the midweek defeat in Dortmund. Tonight’s match against Düsseldorf, another team that will be in the relegation dogfight for much of the season, was important to regain confidence. Furthermore, the three goals will go some way to make up the seven conceded during the week in the long-run. Fortuna have lost their last five Bundesliga matches against Nuremberg. Düsseldorf won their last two Bundesliga 2 visits to FCN, but have never won there in the top flight, claiming just one draw in 13 visits. Behrens scored his first Bundesliga goal. He bagged 14 in Bundesliga 2 last season, which was the most of any midfielder.